Hello everyone! My name is Olga, I'm a newbie board member looking for help. I'm working on a historical fiction, and would greatly appreciate help with understanding the etiquette of wearing a sidearm. I have a lot of questions... so here goes! 1. In illustrations of nobility of the time, I see a lot of daggers. How accurate is that depiction? 2. I’ve read that in HRE men were required to wear a sword in public. Did that apply to nobility as well? 3. If yes, was it swords or daggers? 4. Would they wear them even at court, around Very Important People? 6. What was the extent of sidearm etiquette? Would a guy not even think of leaving the house without his weapon, or was it situational? 8. Would they have something fancy for special occasions? 10. For visual reference - what kind of dagger or sword would HRE nobility wear? (Rondels were all the rage back in the day, but I’m not sure if that was across the board, or if the nobles used something else.) Same question for Italy - any specific style of dagger? And a question for a situation in the story -- if a prince from the HRE was sent to live in Italy as a political hostage, would he be banned from wearing a sidearm? Or would his status as a royal trump his position as hostage? Oof. That's a lot. XD A huge thank you in advance to anyone willing to share their knowledge on the subject! I’ve had a surprising difficulty googling this, so your answers will be most, most appreciated! Hello Olga, welcome to the forum. You've got a lot of questions and I'm sure there will be a lot of debate. Franks from the Holy Roman Empire <--> A Habsburg prince --> NO. Habsburg is a family from modern Austria. Austria and Franconia are not the same. I can tell, I'm from Franconia, and if you call me Austrian just one time! I dare you DON'T! As your story plays in the second half of the 15th century (when exactly?) it could be argued that your Habsburg prince was from Vienna. As the Habsburger resided there. 1. 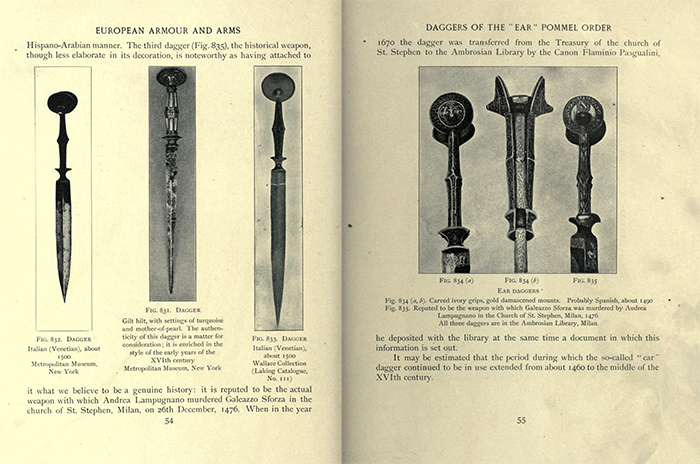 Quite accurate, men wore daggers for self defence, they also served as a status symbol. 2. Nonsense. A peasant man was not allowed to carry a sword. Neither was a town citizen. Swords were for the nobles. There are of course exceptions to this rule. 8. Parade equipment existed, if you could afford it you could wear it. 9. Depends on the individual preferences as well as the amount of money he has. 11. He is a PRINCE, no one would ever dare to call him a hostage. Of course he 'd be free to carry weapons. It can be assumed that he 's smart enough to understand the situation he is in. But he wouldn't be locked up in a tower for all eternity. 1. What prince are we talking about exactly? 2. Why and how did he end up in Italy? For some flash and bonus historical/cultural points, consider an "ear dagger". The one shown here is later than your story, but will give you a general idea of what these looked like and give you a start finding earlier examples. This seems like a Jean Chandler question - perhaps I can link you to a presentation from a few years ago? I'd also shamelessly plug his writing, because I feel I've learned a good deal from it. I saw Holy Roman Empire and thought Germany, completely overlooking the fact that your setting is in Italy, which I know nothing of. I still highly recommend watching the presentation, however. Regarding Italy, it's important to remember that laws were different from city to city. We refer to the Italian States for a reason. There seems to have been a healthy level of paranoia regarding outsiders, be they non Italians, or just from a different city. To the best of my knowledge non citizens in Venice at least were forbidden to carry any thing bigger than a knife within the city limits. I'm not really sure about the finer points of the laws involved, and obviously visiting nobles were granted greater liberties than common folk. I also get the impression that Roman laws about carrying weapons in the city were extremely draconian although the level of enforcement may have varied. Can I ask what would be the proper term for someone from the HRE at the time? Obviously it encompassed peoples from various regions. I just don't know how to refer to them collectively. "That Matthias is a decent guy. Too bad he's a Holy Roman!" Hahahaha! No. There must've been a way of talking about the people from HRE collectively. Especially for people outside the empire. Kinda like we refer to someone from US as American, even though they could've come from any region and any ethnicity. The events are entirely fictional, so there hasn't been a need to decide on a particular year. I'm just using second half of 15th century as a guide for researching weaponry/fashion/general political climate. Yes, the Habsburg prince character is from Vienna. Though since the emperors held a traveling court, it would be accurate to assume that they spent parts of the year in various strategic locations around the empire, correct? This is a fictional child of emperor Frederick the Third. He ends up in Italy as part of peace negotiations. There was a situation that could've resulted in a war. But the Emperor doesn't have the money to conduct a full-scale campaign right now, so he proves his peaceful intentions by sending his son to live in Italy. Kind of like, "Heeeeey, Italian territories. Let's not fight, I *totally* didn't mean anything! Peace means *so much* to me, and I'm gonna prove it. Here, have a prince. I would never attack while my own flesh and blood is living among you!" So yes, the character wouldn't be locked up in a tower. Would be living quite well, actually. I just wasn't sure if his sidearm could be taken away as a gesture? Or, again, his bloodline trumps everything and Italians wouldn't even dream of asking him not to wear a dagger. Thank you very much for your help, Peter! Wow, those are indeed flashy! Thank you so much for uploading the book spread, as well. I'm excited to dig in and look up more about this style. Can I ask what would be the proper term for someone from the HRE at the time? Italy, partially, for example was part of the HRE as well at some time. But you would never call an Italian a German. Bohemia, now in Czech was part of the HRE as well. Still today these are Czech. So the best you can do is to address each individual, or group of people, by their origin. Franks, Bavarians, Styrians, Swabians, Saxons and so on... the only thing that united them, to some degree was the German language. I guess you could call them Germans. The idea of a collective German nation came up after the Battle on the Lechfeld in 955 near Augsburg where an army made up of multiple German "tribes" (got no better word right now) fought of a Hungarian army. If I were you I'd still try to pin down a year where the story begins. Clothing in 1452 looked very different from clothing in 1496. As your prince went under these circumstances he would have kept his arms. However the Italian states were fighting a lot which makes me wonder.... Friedrich sends his son to one of these cities. And now? What 's the reason for the situation he is in. How does sending your son away prevent a war. Why do you think that just because you gave your enemy your son he wouldn't attack you? Just out of chivalry? Ma'am we are talking about Italians here! If a Venice merchant sees the opportunity to sell thousands of weapons to a new army, he will do everything to get a war running! And won't mind the fact that in Milan the Emperors son is living. From what I vaguely understand-- I haven't studied the politics of the period in any particular depth, so take this for all it's worth, and a buck-fifty will buy you a cup of coffee-- the HRE was only really an entity at the very highest levels of state, and the individual countries that were part of it were largely independent and frequently fought with each other. The only time that the HRE really became a thing was when you had international treaties, negotiations, and the such going on, and in that case it gave a certain level of representation to the smaller German and Italian states on the world level. As such you wouldn't call a person from one of those states a "Holy Roman", you'd identify him as a Slovak, or a Bohemian, or an Austrian, etc. You can say something like "Franz is a Wurttemberger, part of the HRE" or something like that, though. "All of which, thanks to God, I have received knowledge of through various examples of expert masters and the doctrines of Italians and Germans, and above all from Master Johane, called “Suveno”, who was a student of Nicholai of Toblem in the Mexinensis diocese, and also from many princes, dukes, marquises, counts, and from countless others in diverse places and provinces." You will note that in his preface, Fiore makes well to mention which regions the people he speaks of are from. I am certain this would equally apply to certain cities as well, if that were particularly applicable. Actually it is not that simple. In the 15th cent. the Holy Roman Empire was ruled by the Habsburgs. They remained Kaiser until the first World War. Yes, the Habsburg family still exists in Austria, but it is a very old family. The first habsburg Kaiser was crowned in 1273 (Rudolf I). But the HRE was fragmented in many different regions which tried to govern themselves as much as possible. There was constant struggle and it would be wrong to see it as a uniform empire. In the 15th cent. the HRE included part of Italy. We know that at the end of the 15th. cent even peasants wore swords (i.e. Woodcut of three peasants by Albrecht Dürer). The local customs and laws varied vastly so you really have to dig up the law and custom of the time and place to be sure. There is no overall answer which holds true. So I am afraid, that you will have to do some serious research. I doubt that you will get a definite answer here in this forum unless you have specialists for each time and place you need. I agree with Mr Schmidt and would add that it is a mistake to assign to medieval constructs such as the HRE the concept of nationality as we understand it post nineteenth century. Identity was a more local affair, and this is amplified when your political construct is trans-national, from slavic people in the east of the empire, to Italian states in the south, German and Austrian and dutch cities and countryside, parts of Switzerland ( think of William Tell)...and though they all owed fealty to the imperial dynasty, their identities and first loyalties were in line with their provenance. This can add to your storyline as the persona you construct will have layers of complexity far beyond the simple german vs italian stereotypes which emanate from of our modern, often hollywoodian, views. Keep us posted on your progress, I am always on the lookout for good historical fiction. If you haven't already encountered it, you might be interested in reading B. Ann Tlusty's The Martial Ethic in Early Modern Germany: Civic Duty and the Right of Arms (Palgrave Macmillan 2011), which gives a good idea of the complexity of some of these issues. Although it concentrates on the situation in German-speaking imperial free cities, especially Augsburg, somewhat after the period in which you're interested, it offers an excellent overview of the kinds of decisions that people had to make about the carrying and use of arms. As others have said, for information specific to your setting, you'll pretty much just have to do the research. Tlusty's book should serve well as a guide to the kinds of sources that will be most productive. I'm afraid that I'm not clear about what you're asking, possibly because you're not quite sure what you need to know. Are you asking whether the iconographic sources accurately portray the frequency with which nobles carried daggers? Do you mean that you expect to see swords as well, but don't? Do you perhaps wonder whether weapons are shown more frequently in portraiture than they were carried on an everyday basis, or whether in the pictures they may have some purely symbolic significance unrelated to whether the subjects of the pictures actually chose to carry arms? Incidentally, in German-speaking imperial free cities, it was unusual to find nobility in the way we generally think of it. Such cities were generally ruled by a(n originally) mercantile patriciate, who sometimes were ennobled later in their family histories. Stereotypical (i.e., to nonspecialist twenty-first-century Americans) nobility usually had estates outside the imperial free cities. I am not sure whether the same situation existed in Italy, nor, if it did, how common it was. You'll very likely need to research each region and city separately to find the answers you need. That depends on where you were and when. More research. Which court, and which people? The rules of the imperial court were likely to be different from those of a city's administration, or a noble's retinue. You can guess that I'm about to say that any regulations would have depended on the particular city. Weapons in Europe were almost invariably class markers, so class status is always going to be a factor. Sometimes it will ensure that someone who has an option about carrying weapons will do so, and sometimes it will mandate that everybody of a certain status must carry arms. Subject to the caveats above, if you were entitled to carry arms, you generally did so, even if you were rich and powerful enough to have a battalion of bodyguards. As discussed above, weapons were a mark of status. This is not to say that somebody who didn't have to rely on himself for self-defence would necessarily carry a practical weapon. You probably wouldn't wear one in the public baths, or at functions where they might be specifically prohibited. (Then again, if the penalty were only a fine and you were showing off, you might choose to pay the fine.) Assuming that arms would not have been worn in one's own household is not a safe assumption. It still depends on context. When retiring for the evening, you probably wouldn't wear weapons to bed. If you were giving a party, maybe you would, as fine weapons would be part of your dress and ornaments. Maybe several somethings, if they could afford it. It was not unknown at certain times to have weapons, or sets of weapons (including scabbards, suspensions, and other accessories) that matched your various suits of clothing. See above. No doubt the occasional eccentric person had the lucky sword or dagger that he liked to carry all the time, even if it was the equivalent of wearing sneakers to a black-tie ball, but that would probably have been rare. Other respondents have given very good answers above. 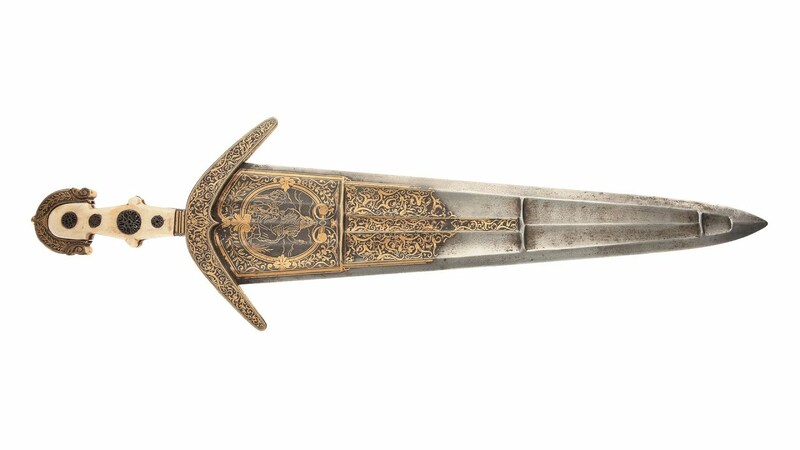 I'll limit myself to saying that in my experience, most contemporary styles of swords and daggers could be blinged to the max, so anything that wasn't wildly obsolete or that hadn't yet been developed is potentially possible, given enough ornamentation. Certainly there were currents of fashion that made certain styles preferred ones in particular times and places, but you'd have to . . . well, you know. This is answered better than I could do by others above. I hope that this proves somewhat helpful, and isn't too redundant given the answers you've already received. Gentlemen, thank you SO MUCH for all of your thoughtful replies!! My big takeaway is that Europe in 15th c is a hot mess. XD I fully understand that details vary from region to region, and I'd have to research a particular area to get the accurate info. But your replies are more helpful than you think. Michael Beeching, thank you for linking those youtube lectures!! "Sword in daily life" was really great, and I also enjoyed the presentations about Guilds, and the Free Cities. So much great info. Thank you all! I'm so glad I came to the forum. Its a wild non-fiction read... Enjoy. WOW. I am so excited to read this!! Yeah, it's a bit later than the time period we've been discussing, but a first-hand account from around that time would be amazing. Thank you for the great rec, Richard!